For special occasions like weddings, events, parties, SXSW, ACL music fettival and more. 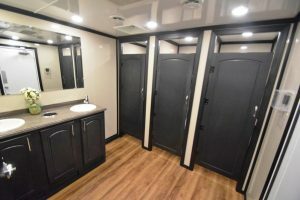 These are the fanciest restroom trailers in Texas! Texas Luxury Restroom Trailer Rentals rents several trailers for special events. 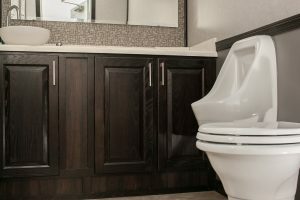 These units are a big step up from porta potties and come with running water, sinks, climate control, music, and the luxuries of a home restroom. 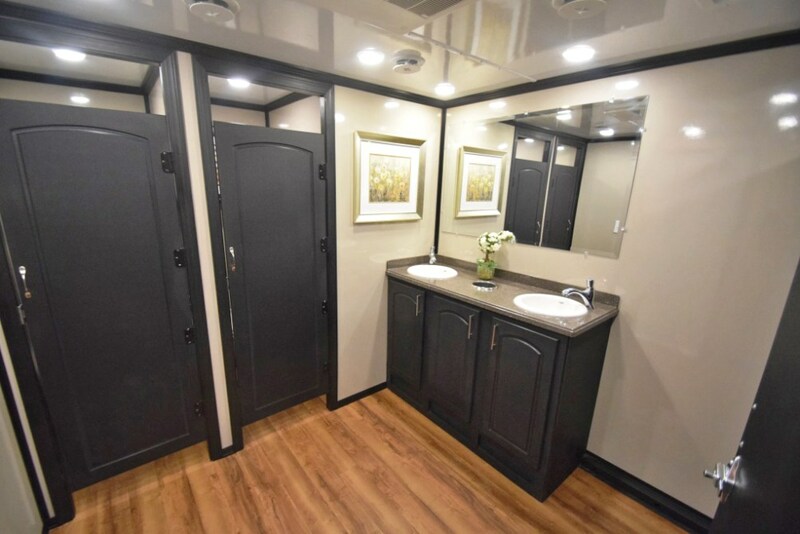 Our fancy water flushing mobile restroom trailers have separate men’s and women’s restrooms and all come with flushing toilets, air conditioning/heating, sinks, and lighting on the interior and exterior. 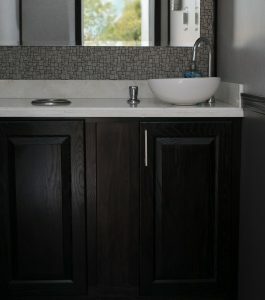 All of our restroom trailers will make your guests as if you have walked into your own home bathroom. 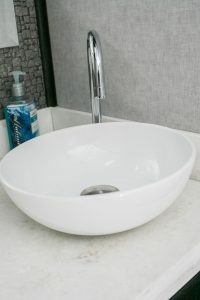 We have several sizes available. The following are representative of the many units that we have available for you. 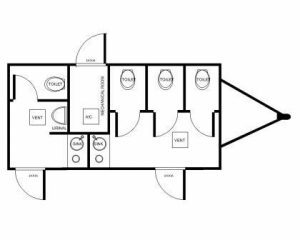 You can rent one or many trailers to accommodate your party’s needs. 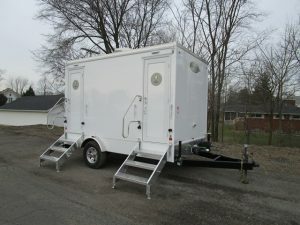 Our basic 2-station restroom trailer with a single mens side (toilet and urinal) and a womens side. Dimensions: 11’6″ tall, 225″ long including hitch, 142″ wide with stairs extended. 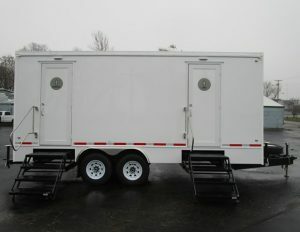 Our delux 2-station restroom trailer with a single mens side (toilet and urinal) and a womens side. Dimensions: 11’6″ tall, 225″ long including hitch, 142″ wide with stairs extended. 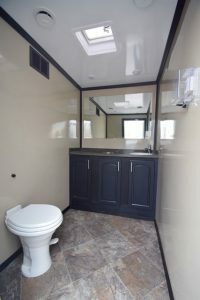 Our luxury 5 station restroom trailer with 3 closed toilets on the womens side and a urinal and closet toilet on the mens side. 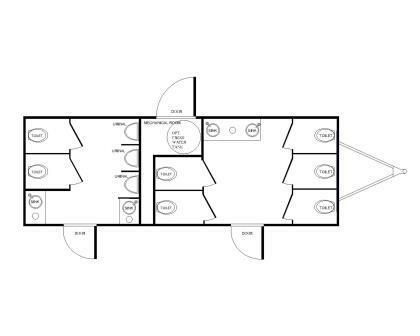 Dimensions: 11’6″ tall, 273″ long including hitch, 142″ wide with stairs extended. 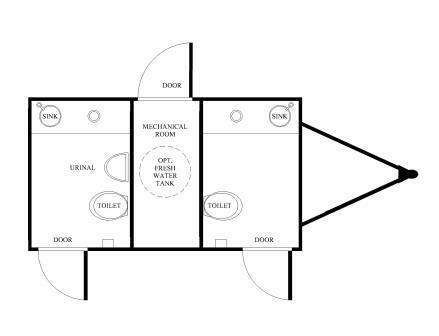 10 Station restroom trailer with 5 private toilet rooms on the womens side and 2 private toilet rooms plus 3 urinals on the mens side.